In 2001 I decided that enough was enough when I weighed 334lbs. 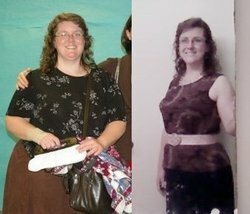 I had bariatric surgery to try to save my life. 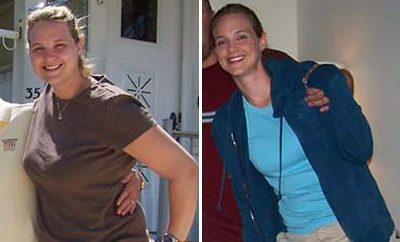 It was scary, but I had gained & lost 100+ lbs so many times, I didn’t have a choice. After the surgery I lost about 120lbs. I didn’t really work out, and ended up gaining 30 back. I stayed around 200lbs and thought that was it for me. I received a Wii Fit for Christmas one year and I LOVED it! I worked out every day! I did all kinds of work outs, when I hit a plateau, I would wear weights on my arms, or find something new to do on the Wii Fit. I did that for 3yrs!! 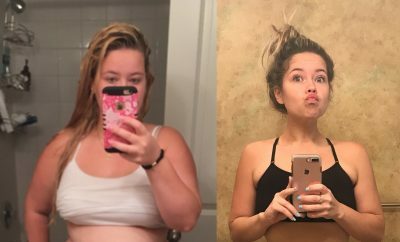 I lost 40lbs! I had some personal traumas in my life and never let it derail my working out. I discovered healthy eating along with my work outs. I would incorporate EVERYTHING into an exercise! If I needed to pick something up, it was a squat or lunge, things like that! It just started falling off!! I still saw that fat girl in the mirror, though. I had to go to the store due to nothing fitting and I almost had a heart attack because I was a size 8! I bought the clothes, not even checking to see if they looked good…..lol I was running through the store crying (with the size 8 on)…I then started walking to work, walking to the store, walking to every place I could, I live on an island so it is possible! Saves me $$ on gas, too! I have lost 205lbs all together & I am now running 3.1-3.5miles a day on my treadmill first thing in the morning when I wake up, I am in a size 4!! I I wear 5lb weights on my upper arms. I have really bad issues with skin on my arms & thighs, though. I still can’t wear shorts or short sleeves, but I hope too one day! I am 45yrs old and I have the best Granddaughter in the entire world. My goal is to one day be able to take her to the beach or a pool. I never took my own children because I was too embarrassed for them and for me. But, I am happy to be healthy & have energy in SPADES! I am thankful for every day that I am given in this new body! Thank you!